Việt Nam’s national football team received a hero’s welcome as they returned home following the Asian Cup on Saturday. As the team landed at Nội Bài International Airport, hundreds of fans were there to meet them. The men’s team narrowly missed out on a place in the semi-final after losing 1-0 to Japan last week in the United Arab Emirates. They were also greeted by representatives from the Ministry of Culture, Sports and Tourism and Việt Nam Sports Administration. Minister of Culture, Sports and Tourism Nguyễn Ngọc Thiện congratulated and thanked the whole team. Later, he gave lucky money to each player. 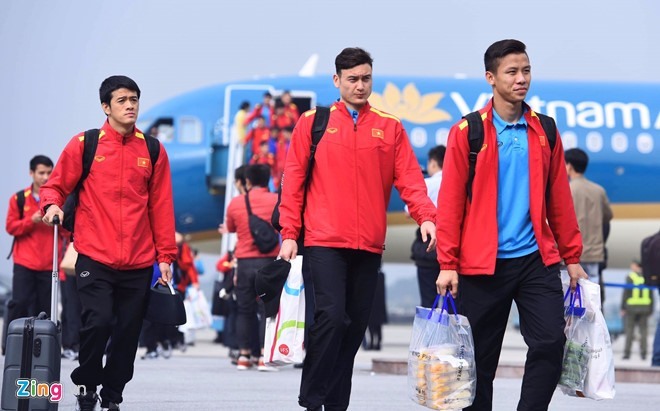 Head coach Park Hang-seo and captain Quế Ngọc Hải led the team through the airport. Players will spend Tết holiday with their families and relatives, but coach Park went straight to Hàng Đẫy Stadium to watch a friendly match between Việt Nam Under 22 team and Ulsan Huyndai Club from South Korea which finished 0-0. Speaking to the media, goalkeeper Đặng Văn Lâm said the team felt tired after returning, but all players were emotional after the warm welcome they received from fans. According to coach Park, the U22 team will be his main focus this year as they are the future of Vietnamese football aiming for a place at the Tokyo Olympics in 2020. Another target is winning the SEA Games 2019, held in Philippines from November 30 to December 10. The national team will also gather for the qualifying round of World Cup 2022, in September. The coach believes his team is in their best form so they do not fear other strong rivals like Australia or Uzbekistan. To prepare for World Cup 2022, the national team will play at the East Asian Football Championship (EAFF), meeting South Korea. From June 1 to 9, the team will also join Kirin Cup in Japan, a tournament of only three teams. The first qualifying round of World Cup Asian region will have three stages, starting in September. Việt Nam will play six matches this year, with three at Mỹ Đình National Stadium. This will be a chance for fans to see the new faces chase qualification to the World Cup.